Just what is a Pawn Shop? You see them in the various parts of town and you have been wondering just exactly what is the pawn shop, how do they work and why are they becoming more common place? But... you haven't asked. Well to answer your question, let's look at the history of pawn shops. Pawn shops date back to ancient times and are one of the earliest recorded lending institutions. During the late middle ages the House of Lombard in Europe had a group of Pawn shops. The sign of the House of Lombard was three golden balls an the sign was associated for years with the pawn industry. The pawn industry come to America with the first settlers and in the early part of this century pawnbroking was regarded as the main source of consumer credit. With the rise of large consumer institutions, such as finance corporations, savings and loan associations, and credit unions, the pawn shop is no longer the major source of consumer credit. But the pawn shop still plays a vital role in the area of providing consumer credit. The general public needs to borrow small sums of money that other sources are not willing to provide them and this resulted in the rise of popularity of pawn shops. What chance do you think you would have in securing a $300.00 or smaller loan from financial institution for a 30 to 90 days period? The cost of the paper work alone prohibits them from making such loans on a regular basis. Good value at a good price. Get the most for your dollar. Vast savings on outstanding merchandise. A good deal. Bargains basement and close-out prices everyday. Where can you find these things and much more? At your pawn shop. If you are interested in saving money and finding great values, the pawn shop is the place for you to go. Today's pawn shop has it all. Quality merchandise at outstanding prices is what is the modern pawn shop is all about. Previously owed merchandise of excellent quality can be found on the shelves of your pawn shop. Every time a pawn broker loans on an item he knows that someday it could be on his shelf for sale. Therefore, he only will deal in good quality merchandise. Also, the pawn shop is an established business. The pawn broker is not here today and gone tomorrow like the flea market, auction sale, garage sale, or the guy selling out of his van on the side of the road. Today's pawn broker knows his business is only as good as his reputation. It's as simple is that. The variety in pawn shop is amazing. Since the merchandise is previously owed, the number of makes and models of merchandise can almost be limitless. You just newer know what you may find in today's pawn shop. You may be asking "Isn't a lot of merchandise in a pawn shop stolen?" Today's pawn brokers are regulated and licensed by the state to insure they do not deal in stolen merchandise. All transaction are closely monitored by law enforcement agencies to see that pawn shop merchandise is not stolen. So, what are you waiting for? There is a world of bargains to be found in your neighborhood pawn shop. Check it out. You'll be glad you did. Shopping in your pawn shop is fun. No where else can you find the veriety offered on the shelves of your pawn shop. There is no other business like the pawn business. What can you find in a pawn shop? Variety makes visiting the pawn shop an exciting and enjoyable experience. You would have to visit dozen of different retail stores to find all thr different types of merchandise found in the single pawn shop. 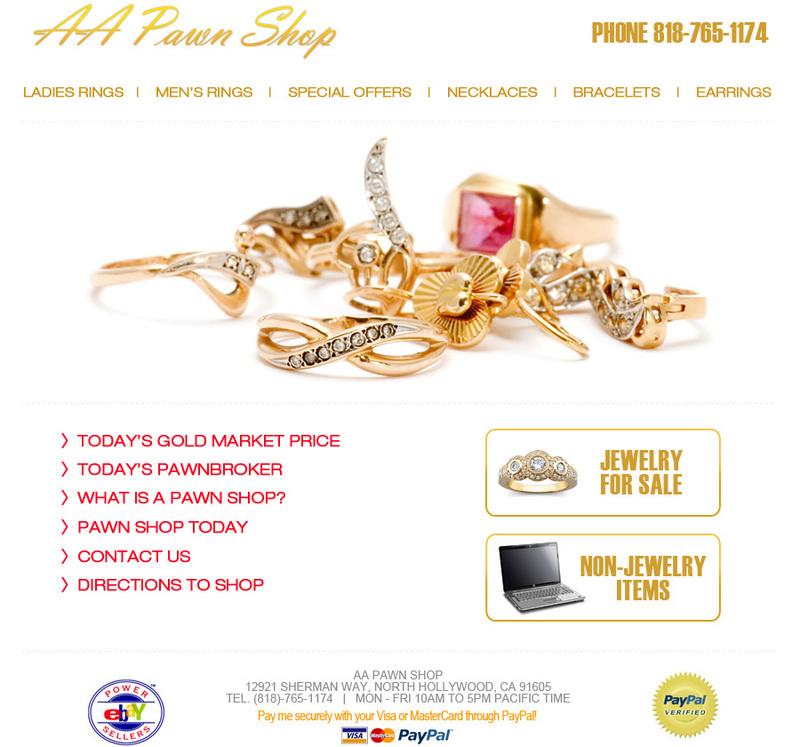 Jewelry, silver, clocks, stereos, sporting goods, cameras, computers, musical instruments, TV's, VCR's, camcorders, tools, bikes, coins are just few of the things to be found in the pawn shop. The list goes on and on. The good thing is that the merchandise in pawn shop is always changing. So, whenever you visit your favorite pawn shop, there will always be something new for you to see. Have you looked in your pawn shop lately for the things you need now! - at Great Savings!